Batman may return to Arkham, but writer, Paul Dini, isn't coming with him. Veteran Batman writer, Paul Dini, has confirmed that he isn't writing the rumored Silver Age prequel to the Arkham series. Of course, he may not be writing it because it might not exist; Dini simply stated that, whatever the next installment of the series might entail, he isn't involved. "Kinda hoped I'd be doing another Arkham game in London during the Olympics," he Tweeted during the Olympics opening ceremony. "Esp, as I had good source for tx. Ah, well." This sparked an impromptu Twitter interrogation as Bat-fans clamored for more info. Dini, who was one of three writers involved in the series, confirmed that even though he loved working on the first two games, he wasn't returning for a hypothetical third title. "I wish I could," he said, when one fan asked Dini to continue writing the series, "but it's not my call." Dini's portfolio reads like a cartoon greatest hits list. He's penned episodes for He-Man, Tiny Toon Adventures, Batman: The Animated Series, Batman Beyond, Transformers G1 and Star Wars: The Clone Wars. Alongside Bruce Timm, Dini created fan-favorite Harley Quinn for Batman: The Animated Series. 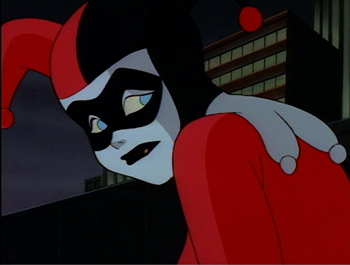 Harley's origin story, The Batman Adventures: Mad Love, netted both writers an Eisner Award back in 1994.